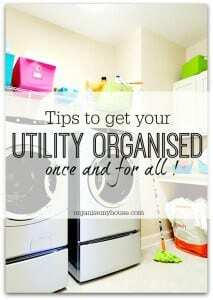 Tips to get your utility organised once and for all! Your Utility is the place where the work gets done. Its the place that should run most like clockwork in your home to ensure that everything gets done on time and to the right standard. Ensuring that things don’t build up in this room, and that you can access all the items that you have stored in it are key to the functionality and practicality of the space. If you are lucky enough to have a utility room, or even a utility space in your home, then you deserve for it to be a beautiful place to be. Noone wants to do jobs in a messy and cluttered environment, and if you enjoy being in the room then you will be more likely to keep it tidy, and for it to work for you ongoing. If you have your utility space as part of your kitchen or garage you can still transform that area into a perfectly functioning hub of your home! If you tackle this room you will feel the benefits throughout the house. Less mess from clothes strewn around as you will have created a system for clothes that makes sure they keep moving through their natural cycle. You will have a cleaner home as you will be able to get to all the cleaning products and items you require, and you will generally feel happier about the jobs involved with managing your home. Make it a great place to be and your family should be more inclined to help out too! Here are some great tips to get started in your utility – use one or all of them – but start somewhere and I promise you won’t regret it! Maximise storage in this space – you will always need lots! I find that fitted floor to ceiling units work really well, or racks mounted on the wall so that you have a place for everything and you can easily get to everything. Label each shelf with what should be on it – this will help all members of the family to find things and to be able to put them away too! Keep dangerous items such as bleach, matches and razors out of the reach of little children – a top shelf or cupboard would be ideal. You may even want a locked cupboard for medicenes in here as well. This is a great place to house things like a first aid kit, a sewing kit, a box for items needed in a power cut (torch, candles, matches etc…), in fact, anything that you need to run your home smoothly. Create a basket or holder that always has each of your cleaning items and products in for a general clean – that way you can grab it and get started on the cleaning saving time! Store things where you need them. When bending to put washing into the machine, you don’t want to have to reach far for the washing powder and fabric conditioner, for example. Work with the space you have – and to maximise it then consider adding shelves and baskets. Keep a bag ready at all times for each of the following – then you can easily pick it up when you are heading out to do errands – DRY CLEANING, ALTERATIONS, CHARITY etc… You are most likely to find clothes that need something doing to them when they are put in the laundry – so get into the habit of checking clothes as they go through the washing. 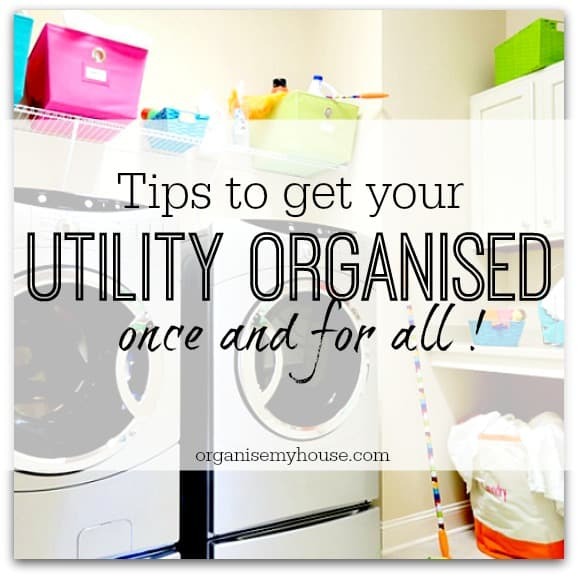 Why not have a go at getting your utility organised using some of these tips and see how much easier it is to do all those daily chores. Maximise the way you use the space, and get things stored out of the way while still being accessible, and above all, enjoy using your utility – you may as well love it! Do you have tips to share for organising your utility space? I’d love to hear them so please leave them in the comments below – thanks in advance! Previous Post: « 23 things to declutter today!